Bing has had a pretty eventful year in 2014, especially in the last few months. In just the past couple weeks, the company announced changes to their ad user interface and last week the introduced their conversational search algorithms. The big news from Bing this week also involves additional features to the Bing Ads platform. In a recent blog post, Microsoft announced more than seven new changes to the Bing Ads platform. The changes to the Bing Ads Editor (this will be version 10.5) are substantial. Each could would be newsworthy to marketers on its own. However, by announcing all at once, the company may be hoping to catch the attention of business owners and marketers who had avoided Bing Ads in the past. The negative keyword library will make it easier for marketers to consistently apply certain negative keywords to all of their ads. Negative keywords are terms an advertiser doesn’t want their ad shown to. To illustrate, retailers may want to restrict their ads from showing to people searching for products along with the term “free”. 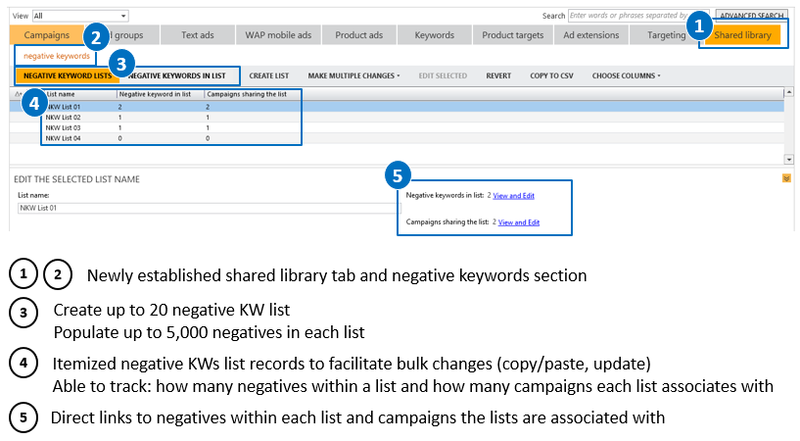 When marketers have multiple campaigns or a many variations within a campaign, time-saving tools like these can be very useful. As was mentioned in a previous article about Bing updates, improving the ease of user experience has been a major focus of recent improvements. Aside from the negative keyword library, the import and export will make it easier for marketers to easily work on multiple campaigns and multiple ad platforms. The concern for making it easy for Google users to use Bing as well was noted in the blog post. The blog notes that users can now review the results of the items they import from other platforms like Google. After common tasks like “make multiple changes,” importing data from files, or migrating campaigns, the imported changes will be automatically identified and displayed as: new, updated, deleted, or skipped. The new ad schedule feature and the new ZIP Code targeting options make it possible for marketers to target their audiences more specifically. There are several options for local customization that marketers working in different regions can use. Of course, there are limitations to these new features. For example, the negative keyword library can only have up to 20 negative keyword lists. However, each list can have up to 50,000 terms. Also, previous Bing marketers who were used to the “Time of Day” and “Day of Time” functions will see those functions replaced by the Ad Schedule feature. And users can only program up to seven ad schedules per day. Once marketers get used to these adjustments, they may be able to use the new Bing features very effectively. The introduction of the Bing Ads Editor 10.5 is another move to make Bing a more attractive platform for advertisers who are already using tools like Google AdWords. By making it easier to import and export options on multiple campaigns, Bing has significantly lowered the barrier to entry. Now that it takes less time to start using Bing, marketers should consider giving the platform a try to see if it increases their ROI for internet ads.